I have now had my Thermos Shuttle Chef cooker for a number of years, now this is specially made steel pots, one that gets heated and the food is brought up to a boil and or is simmered at a slow boil for up to 15 min (which seems the longest time given in any of the recipes) and then you take it off the heat and put it into your outer steel pot and it continues cooking and staying safely hot for up to six hours. A hay box, straw box, fireless cooker, insulation cooker, wonder oven or retained-heat cooker is a cooker that utilizes the heat of the food being cooked to complete the cooking process. Food items to be cooked are heated to boiling point, and then insulated. Over a period of time, the food items cook by the heat captured in the insulated container. Generally, it takes three times the normal cooking time to cook food in a hay box. During my reseach into this idea, I had found out that it was very popular in Japan, and was being used as a way to cut energy use and still be able to cook full meals that are served hot, this is backed up by my new cookbook that came with the gear, while I do have a english version, its been translated from their recipes.. Stewed black mushrooms with conpoys and Black Moss anyone? So I got a fairly large shuttle chef, my inner pot can hold just over a gallon but as you are only to fill it 3/4 full, it should be able to feed a family or a couple meals for us. My first test was as they directed with hot water, and dang, does that puppy keep it hot! I checked it at 3 hours and 6 hours and was very pleased with the results. My second test was to cook up four big suasages, I put just enough water to cover them, brought them up to a boil, which took four min of power on the small stove burner, and then into the shuttle chef for a continued cook time of two hours-Note, they didn’t have a cook time for this food , but as whole chickens, pot roasts and pork roasts were to get three hours, I figured it was safe to check at two hours, but it might have been done sooner? I am having a hard time figuring out how much energy I used for my heating time on the stove, I have a rating on it for a per hour use but it does not break it down to per burner, so I can’t give a honest amount used but the average time to cook those same type of meat would be at least 20 min on the stove and at least 40 min in the oven.. either way, I used less power. So the Ecozoom has my water boiling in 5 min with the use of half a branch worth of dead fall twigs and the leaves on the twigs, so in that case, no outside energy costs required to get the shuttle chef to its cooking point, it took about ten min from start to finish to get the ecozoom ready, heat up and on, the water done and the stove closed up and allowed to finished burning the coals and done. I am unsure how you figure out any costs of deadfall twigs off one of my trees? but I guess you can factor in the cost of the ecozoom stove, the cost of the shuttle chef up to a point per meal till they are paid off but in any case, I am happy to have the choice to be able to cook with this, my next pot will be done on the ecozoom and I am going to try out a long cooking time item being beans or rice following the shuttle chefs cookbook on timing etc. Update: the meat came out perfectly and was still hot enough that you needed a tong to lift them out, then I could not help but notice that the pouching water looks amazing, so I re-heated the pot to boiling, this time less then a two min to do so, and add in the right amount of rice and some seasonings and back into the outer pot it went, so I should have rice ready to go with fresh veggies with some diced in cooked meat for supper. Most of the above post is taken from my first overview of the pot, I have since had it for 5 years, its been used in the house, its a crock pot that uses next to no energy, it works to keep hot drinks hot on trips, it packs up for a potluck dinners like a dream, it can be chilled and works well for cold dishes as well. This product was so worth the investment and at some point, I will get another one that has two pots in the same space for different foods, as that is the only thing that is not good.. its always one pot meals. So what is your plan to be able to provide hot meals when the power is out? Have you added or replaced any of your cooking items to get better energy rates out of them? Anyone out there using a ecozoom to cook with, or using a shuttle chef to cut your energy use? If so, any hints or types on using this product? This entry was posted in Life moves on daily and tagged Shuttle chef pot. Bookmark the permalink. 10 Responses to Thermos Shuttle Chef Review -5 years later! I’m sitting here beside my wood-fired cookstove as I read your blog……and I have to smile! On December 22, 2013 we lost our power due to a nasty ice storm. We had no electricity at all for several days and then only sporadic, unpredictable power for an hour or two at a time for a couple of weeks; the first day that we had uninterrupted power for 24 hours in a row was on January 8th!! Luckily we had installed the wood cookstove 2 years previously and believe me! – it was worth its weight in gold!! My largest canning kettle full of water went on the back so that we always had hot water for washing up, tea & coffee; I cooked all our meals on it – thank God for cast iron skillets in several sizes!! – the oven not only baked but also dried out wet mitts & socks, and it was our sole source of heat. When I think back on it, it wasn’t the cooking that frazzled me as much as the loss of electric light at that deepest dark time of year. Actually none of it was luck……Hubby and I have been gradually reworking our lifestyle so that we can be more resilient in these type of emergency situations. We still have a ways to go but at least we’re headed in the right direction! I’ve never even heard of either of the alternative cooking methods you blogged about, but they both sound like good preps for folks to think about. You know……..the more I think about it, the more I realize that when we are resilient and ready to help ourselves in an emergency, the more able we are to offer help to family, friends & neighbours who might be caught unprepared. A double-sided blessing, indeed!! That is just wonderful that you have taken those steps towards being prepared, I totally understand as I live in a ice storm warning area. 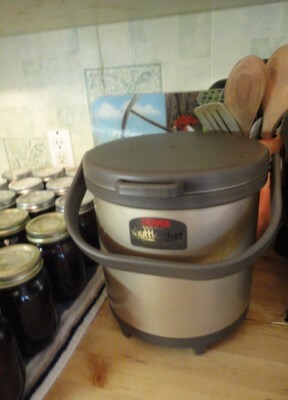 I like the shuttle chef so much because it its one of those things, like your wood stove that can be used for more then “when needed” It can be used as a easy crock pot, that can be prepared, put away and taken with me to friends, potlucks and just us going on a picnic. It can be used to help cut energy costs, and there are times where watching your power use does matter and it matters more and more where I live as the costs of the power bills have become x3 over the past years and they tell us more is on the way! And then there is the fact that it will make sure we have hot meals with min heating outputs in a power down means a lot to me, It was used after fukushima, with the rolling power.. they used them a lot, as often they would know that they would get power in their area for only a hour or two, and so these pots were used to create a full days worth of meals when they had power..
We’ve never ehard of this stove before either. Sounds great!!!! It sure would be a treat to have something hot during field work that would be easy to take you us. Quick question please: the one pic, is tha the top of your stove or what??? Not what sure since I’ve never seen one. Like the idea of using very little power! We do have a wood stove going 24/7 in cold months & in 3 years have used only 145 gallons of heating oil which is amazing in this area. A lot of folks go through 3 to 4 times that amount. We harvest our own wood lot, split & stalk ourselves to save on the costs there. Plus we absolutely love the wood heat, somehow feels warmer & waaaaaay more homey! We’ve cook on top of our wood stove & inside but it’s not a cookstove but gets us by during power outages. Over the years we’ve gathered helpful items for the farm & home but alwyas willing to learm more so thanks for sharing!!!! Oh, this one thing we do to pass a stormy day…..we fill a small STORM box with iteresting things that we can do. A puzzle, a magazine, fabric to cut out, leather work project, a tasty treat, hot choc. We don’t open the box unless there’s a storm or update items so by that time it’s opened you forget what’s inside & that’s half the fun! Anything to be cabin fever!!! Oh…..included a pet treat so everybody is included!! Ok, by stove, do you mean the eco zoom stove.. here is the link to it on the blog. The shuttle Chef is not a stove, its a fancy hotbox that you still need a heating source to get it to the boil, but the combo of the Eco zoom stove (which is a very high tec rocket stove) means that you can get your water boiling in minutes with twigs and then use the Shuttle Chef to continue to cooking the meal and keeping it safely hot for up to eight hours.. you can also use charcoal for the ecozoom stove. its flexable that way.